Two hundred years ago this month the military authorities in Vienna took an interest in Franz Peter Schubert and his brothers as part of the Austrian Empire's unending search for army conscripts. The composer's father, Franz Theodor (1763-1830), had taken over as Director of an elementary school in Roßau the year before. His formal appointment came on 24 December 1817. The school had only been open for a year, but the behaviour of the previous Director, Valentin Rosen, had caused a scandal that resulted in his hasty dismissal. Father Schubert's running of his first school in Himmelpfortgrund had been exceptionally successful, its excellence standing out at a time when elementary education in Austria was very hit and miss. The authorities were desperately trying to raise educational standards and Franz Theodor was just the type of person they needed as a school director. Furthermore, elementary schools were still under the control of the Catholic Church, which meant that the authorities were also looking for someone of exceptional probity to repair the scandal caused by the previous director. Rosen's lifestyle had been erratic: he was fond of the tavern and loudly opinionated when in there. There were also some allegations of inappropriate behaviour with his young charges. In that respect someone with an impeccable character was required in order to waft away the bad odour left by Rosen. The pious Franz Theodor, Jesuit educated, among whose friends and supporters there were many relatively senior clerics, was definitely the man to restart the new school. For Franz Theodor teaching was the family business: his oldest son Ignaz (1785-1844) was a qualified assistant teacher in his father's school in Himmelpfortgrund; second son Ferdinand (1794-1859) was employed as a teacher at an orphanage; third son Karl (1795-1855) had ducked out of the family tradition and trained to become a landscape painter; the fourth son was Franz Peter (1797-1828), the would-be freelance composer whose nose was still held to the grindstone as an assistant teacher in his father's school. In his application for the job, Franz Theodor had made much of the fact that he would bring two assistant teachers with him, Ignaz and Franz Peter, the second of whom had outstanding musical abilities. As a result of this commitment, Franz Peter's nose would now be pushed even more firmly down on the grindstone. At that time in Vienna the registration of residents was coupled with the registration of conscripts for military service. 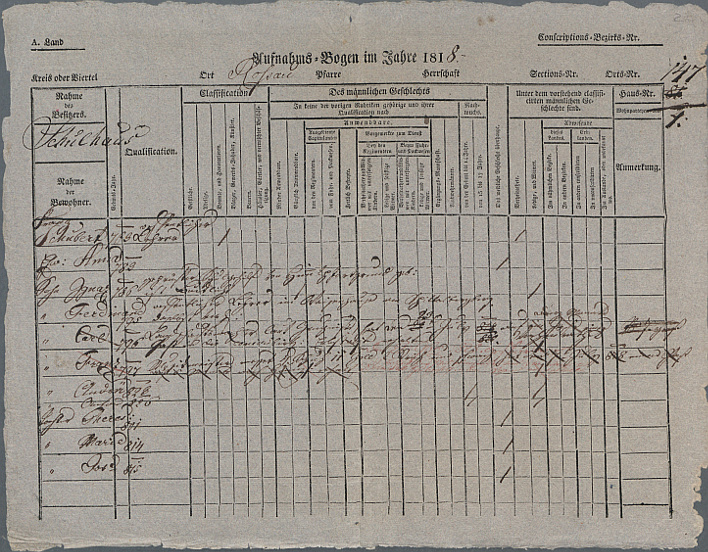 When Franz Theodor moved with his family into the apartment in the Roßau schoolhouse he was required to register the family's new residence and document the eligibility of his sons for military service. The military authorities were always on the lookout for suitable candidates to spend the next 14 years marching up and down in the service of the Emperor. Anyone between 18 and 45 years-old and without grounds for exclusion was eligible. Franz Peter was 20 going on 21 and so could expect to serve the full 14 years until he would have been discharged in 1832 (four years after his actual death). It is sometimes asserted that he stayed as an assistant teacher – if only nominally – in order to evade conscription. This is not correct, since only one assistant teacher in any one school could claim exemption. Franz Peter was actually the sixth assistant teacher in the Roßau school, so he was very low down the pecking order for claiming the single exemption. Personenaufnahmebogen / Konskriptionsbogen Roßau, 1818 for the Schubert family after the move into the schoolhouse in the Roßau. Image: Wiener Stadt- und Landesarchiv. Quelle: WStLA. Licence CC BY-NC-ND 4.0. 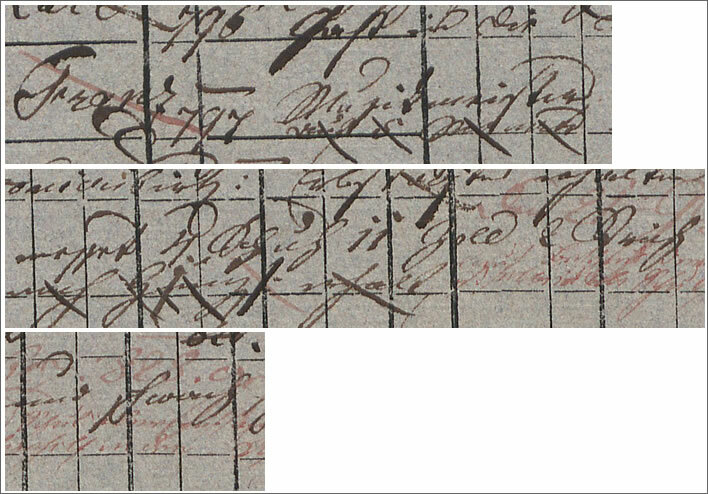 Son Ignaz b.1786 [recte 1785] certified teaching assistant, born in Himmelpfortgrund. is humpbacked. Son Ferdinand b.1795 [recte 1794] public teacher in the orphanage in Spittalberg [now Karlsgasse]. married. Son Karl b.1796 Landscape painter according to documents. … married, tall. This is not simply a snapshot of the family in January 1818 on their move to Roßau. This was an official, centrally-held document that was added to as time went by and thus contains a number of later entries. Karl, for example is recorded as married, but this happened in 1823; Franz Peter's teaching appointment in 1819 is also there, as is the date of his death: 21 September 1828. The sheet functioned as a sort of 18th century spreadsheet, with new entries added and old entries crossed out. No one should imagine that 21st century data hoarding is anything new. Ignaz couldn't be drafted because of his infirmity – hence it was recorded explicitly. Ferdinand, as a fully qualified teacher, had protected status. Karl was travelling around and could argue exemption based on his qualifications as an artist. Franz Peter had no excuse apart from the fact that he was so short. The minimum height was 5 Schuhe – in modern measurements this was 5 feet 1¾ inches (156.9 cm). Fortunately for Schubert, he was a fraction under 5 feet 1 inch tall (154.7 cm). This important value was entered on the registration sheet as the justification for not drafting him into the army, in the same way that Ignaz is explicitly noted as being 'humpbacked'. The absolute values of these conversions into modern units should not be taken too seriously – nearly every province of Europe at the time had its own definition for these quantities but the relative measures are indicative. There were 12 Zoll in each Schuh and 12 Striche in each Zoll. In absolute terms the Zoll was quite close to the modern imperial inch. The fact that for purposes of conscription, height was being measured to the twelfth of an inch indicates how precisely this life-changing value was measured. A twelfth of an inch could mean the difference between 14 years of freedom and 14 years of marching around. Schubert escaped that fate by 10 Striche, a shade over three quarters of an inch (2 cm). So next time you are listening to some of Schubert's music, remember that that music only exists because he was three quarters of an inch too short for the army. Replaced the placeholder image of the Conscriptions/Aufnahmebogen with a high resolution image. With thanks to the Wiener Stadt- und Landesarchiv.